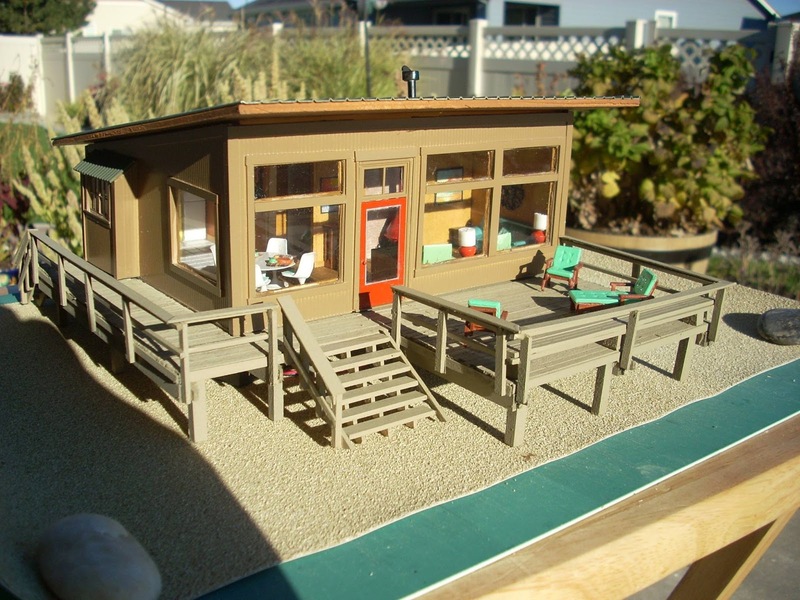 The first in a new series of posts that focus on 1:48 scale miniaturists around the world, this month I'm featuring Kathryn Asbahr and her exquisite quarter scale, hand-made Oregon lake house in smashing mid-century decor. 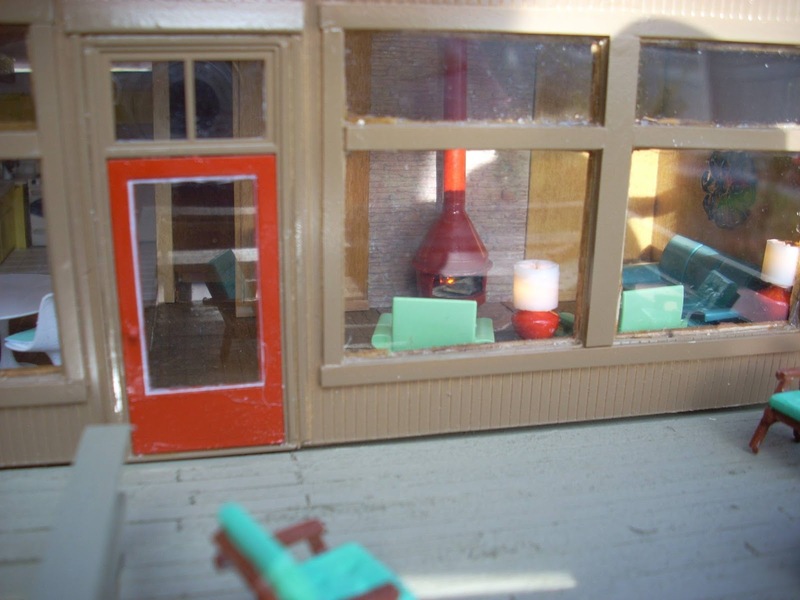 A tiny replica of her friend's real house in Lincoln City, Oregon, no detail was spared in this mini as it is complete with a "working" retro fireplace and tiny mugs on the Eero Saarinen tulip table! Kathryn says that the "fireplace is made from bits of supplies from hubby's HO scale railroad." Kathryn and her husband are miniature enablers. He began as a model railroad builder and when Kathryn retired in 2015 he encouraged her to dig out their old supplies and begin building together. Her skills took off and she even reconstructed the downtown of her youth, complete with the store her godmother used to run. Recently she completed a couple of mid-century houses for her husband's train layout. "He has always been there to help but mostly I have done it on my own," says Kathryn. O Scale houses Kathryn made for her husband's train layout. But it was the model train O scale that transitioned her to 1:48 dollhouses. Essentially the same scale, O scale kits are hallow. "When I started to build the O scale (quarter) building, I knew that there was not much available for the interiors on the train side," says Kathryn. "Research led me to the dollhouse group." Thus a tiny Oregon home was born. 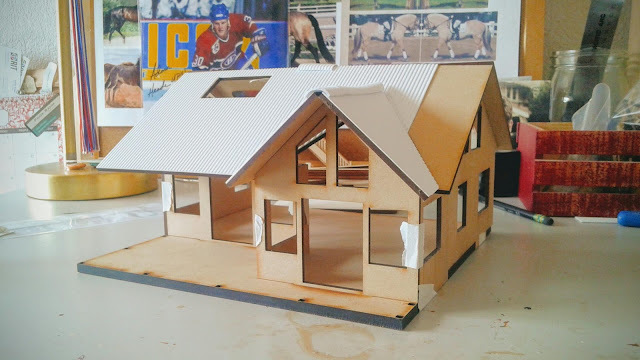 The little house was constructed from plastic modeling sheet for the structure with scrapbook paper and wood veneer for the interior. It features a spacious deck with a tiny welcome mat, big windows for an envious view of the lake and an open floor plan from which to enjoy those views from any point in the house. "We used to joke that if you wanted privacy you better go to the bathroom. It was the only room with a door." 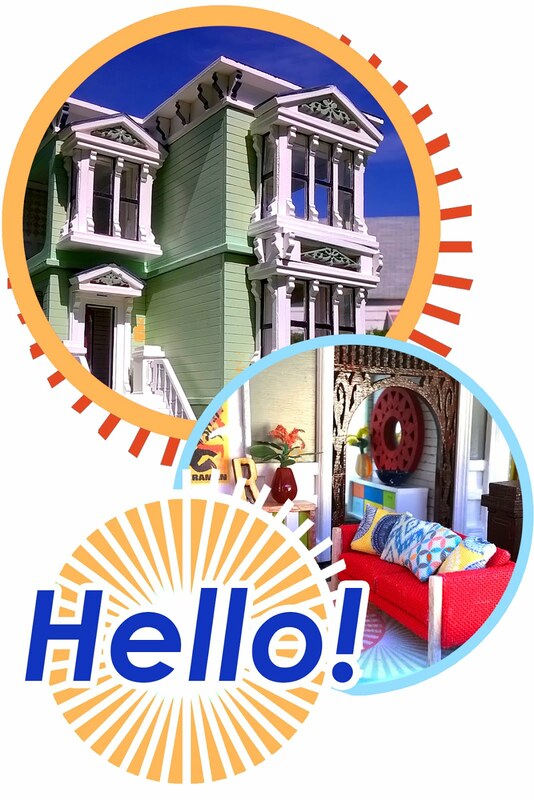 Kathryn is a member of the Quarter Connection where she regularly contributes to group discussion, projects and auctions on 1:48 scale builds with over 1300 worldwide members. This month the group is featuring a weeklong event of projects and workshops with a 1950s theme. As a blog with a mid-century passion, that's Micro Modern Decor approved! Wow! I see why you chose to feature Kathryn and her fantastic work. Thanks!